Earth is the third planet in the solar system in terms of distance from the Sun, and the fifth in order of size. It is the largest and densest of the solar system's terrestrial planets. Scientists estimate that the Earth was formed around 4.57 billion (4.57×109) years ago. About 70 percent of the surface is presently covered by oceans, and the remainder consists of continents and islands. The abundance of water is a unique feature that distinguishes our "blue planet" from others in the solar system. Since its formation, the Earth has been transformed through various geological and biological processes. The Earth's upper layer (lithosphere) is divided into several tectonic plates that gradually migrate across the surface over geologic time spans. Earthquakes, volcanic activity, mountain-building, and oceanic trench formation occur along plate boundaries. The interior of the planet is also active, with a thick layer (mantle) of highly viscous material and an iron core that generates a magnetic field. The Earth is the only place in the universe known to support life, and its position, structure, and composition make it ideally suited for this purpose. Orbiting the Sun at an appropriate distance, this planet receives the proper amounts of heat and light to sustain life, and its rotational and orbital movements allow for daily and seasonal cycles. Its natural satellite, the Moon, is sufficiently large to produce regular tides and to stabilize the planet's axial tilt. In addition, the atmosphere provides useful gases, transports water vapor, moderates temperature extremes, absorbs harmful ultraviolet radiation, and burns up most meteors before they can strike the Earth's surface. The Earth's magnetosphere shields the surface by deflecting charged particles brought by the solar wind. The presence of water and the chemical composition of the Earth's surface play significant roles in the development and sustenance of living organisms. At the same time, the Earth's surface conditions have been significantly altered by the presence of life forms, which have created an ecological balance. Photographic images of the Earth from space reveal its awesome beauty, and at the same time highlight the fragility of our common home, often called "spaceship earth." That image has become a contemporary icon. Unlike political maps, it has no borders. It calls for cooperation and peace among all Earth's inhabitants to assure a future for humanity and the planet. In ancient cultures, the Earth was often personified as a deity, particularly a goddess who, like a mother, gives birth to and nurtures life (see Gaea). The Chinese Earth goddess Hou-Tu is similar to Gaia. As the patroness of fertility, her element is Earth. In Norse mythology, the Earth goddess Jord was the mother of Thor and the daughter of Annar. By contrast, in ancient Egyptian mythology, Earth was symbolized as a male, Geb, and the sky was taken to be a female, Nut. In terms of the Earth's shape, earlier belief systems included the idea of a flat Earth. On the other hand, ancient Greek philosophers and other thinkers, including Thomas Aquinas (1225–1274), believed the Earth was spherical. Arguments used to support the latter view took into account some of the secondary effects of the Earth's shape and parallels with the shape of other planets. Today there is sufficient evidence to indicate that the Earth is an oblate spheroid—it bulges slightly at the equator and is slightly flattened at the poles. The idea of a flat Earth is more frequently treated tongue-in-cheek, or with mockery. 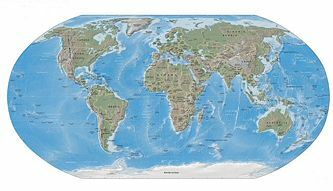 Historically, the disciplines devoted to depicting the Earth's surface have been cartography, the study and practice of mapmaking, and geography. Surveying, the determination of locations and distances, and (to a somewhat lesser extent) navigation, the determination of position and direction, have developed alongside cartography and geography, providing and suitably quantifying the information needed for describing the Earth's surface. The astrological and astronomical symbol for Earth consists of a circled cross, the arms of the cross representing a meridian and the equator (⊕). A variant puts the cross atop the circle (♁). Terms that refer to the Earth may use the Latin root terra-, such as the word terrestrial, or the Latin root tellur-, as in telluric and tellurium. Both terms derive from the Roman goddess Terra Mater, who was also called by the presumably more ancient name Tellūs Mater. Scientific terms such as geography, geocentric, and geothermal use the Greek prefix geo-, derived from Terra Mater's Greek counterpart, Gaia. Earth is the largest of the "inner" planets of the solar system, that is, the planets between the Sun and the asteroid belt. When viewed from outer space, much of the Earth has a deep blue and white appearance, caused by the oceans and clouds in the atmosphere. It has an albedo (measure of light reflectivity) of 36.7 percent, which is exceeded only by Venus among the inner planets. As mentioned above, the Earth is shaped as an oblate spheroid. Its average diameter is approximately 12,742 km. The planet's curvature is visible from some regions on the surface such as the Bonneville Salt Flats in the United States. Earth is also the densest planet in the entire solar system. Its average density is about 5,515 kilograms/meter3 (kg/m3), while the average density of surface material is around 3,000 kg/m3. The mass of the Earth is approximately 5980 yottagrams (5.98 x 1024 kg). When considered in terms of its composition, the Earth consists of the following major layers: the atmosphere, hydrosphere, crust, mantle, and core. Each of these has a number of sublayers. In addition, scientists use the term lithosphere when referring to the solid crust and the solidified uppermost part of the mantle. Below the lithosphere lies the asthenosphere, which consists of the weak (or soft) zone of the upper mantle. The biosphere, which refers to that part of the outer shell in which life occurs, is usually not considered one of the physical layers of the Earth. The Earth's atmosphere protects and sustains life forms by absorbing ultraviolet solar radiation, moderating temperature extremes, transporting water vapor, and providing useful gases. It contains about 78 percent nitrogen, 21 percent oxygen, and trace amounts of other gases such as carbon dioxide and water vapor. The hydrosphere consists chiefly of the oceans, but technically includes all water surfaces in the world, including inland seas, lakes, rivers, and underground waters. Approximately 70.8 percent of the Earth is covered by water and only 29.2 percent is terra firma. The abundance of water on Earth is a unique feature that distinguishes our "blue planet" from others in the solar system. The average depth of the oceans is 3,794 m (12,447 ft), more than five times the average height of the continents. 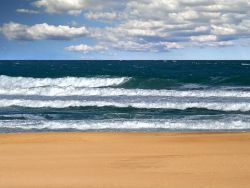 The mass of the oceans is approximately 1.35 × 1018 tons, or about 1/4400 of the total mass of the Earth. The movement of water within the hydrosphere is described by the hydrologic cycle. This cycle includes water beneath the Earth's surface and in rocks (lithosphere), the water in plants and animals (biosphere), the water covering the surface of the planet in liquid and solid forms, and the water in the atmosphere. The outer layer of the Earth is called its crust. It is composed mainly of basalt and granite. It is cooler and more rigid than the deeper layers of the mantle and core. The crust is a part of the lithosphere, which floats on fluid interior layers. Oceanic crust is different from that of the continents. Oceanic crust (sima) is 5–10 km thick and is composed primarily of basalt, a dark, dense rock. Continental crust (sial) is 20–70 km deep and is composed of a variety of less dense rocks. 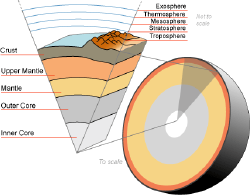 The Earth's mantle is the thick shell of rock that surrounds the outer core and lies directly beneath the thin crust. The mantle lies roughly between 30 and 2,900 km below the surface, and occupies about 70 percent of the Earth's volume. The mantle is composed of silicate rocks that are rich in iron and magnesium relative to the overlying crust. Temperatures in the mantle range between 100° C at the upper boundary to over 4,000° C at the boundary with the core. Because of the extremely high pressures within the mantle, it is thought to be a solid or highly viscous fluid. The high temperatures cause the silicate material to be sufficiently ductile that it can flow on very long timescales. Convection of the mantle is expressed at the surface through the motions of tectonic plates. Seismic measurements indicate that the Earth's core is divided into two parts: a solid inner core with a radius of about 1,220 km, and a liquid outer core with a radius extending from 1,220 km to 3,480 km. The solid inner core is believed to be composed primarily of iron and some nickel. Some have argued that the inner core may be in the form of a single iron crystal. The liquid outer core surrounds the inner core and is thought to be composed of iron mixed with nickel and trace amounts of lighter elements. It is generally believed that convection in the outer core, combined with stirring caused by the Earth's rotation (see Coriolis effect), gives rise to the Earth's magnetic field. The solid inner core is too hot to hold a permanent magnetic field, but it probably acts to stabilize the magnetic field generated by the liquid outer core. The Earth's magnetosphere shields the planet's surface by deflecting charged particles coming from the solar wind. The Earth's magnetic field is shaped roughly as a magnetic dipole, with the poles currently located proximate to the planet's geographic poles. The field forms the "Magnetosphere," which shields the Earth's surface by deflecting charged particles coming from the solar wind. 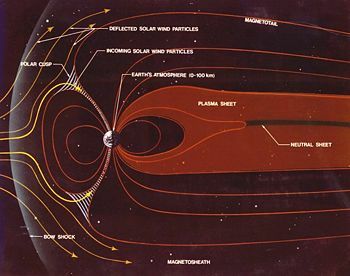 The collision between the magnetic field and solar wind forms what are called the "Van Allen radiation belts," which are a pair of concentric, torus-shaped regions of energetic charged particles. When the plasma (composed of charged particles) enters the Earth's atmosphere at the magnetic poles, it produces a phenomenon called the Aurora. Based on the available evidence, scientists have been working to reconstruct some of the details of our planet's past. It is thought that the Earth was formed around 4.57 billion years ago (see Age of the Earth) out of a gaseous cloud called the "solar nebula," from which the solar system emerged. The moon formed soon after. Initially molten, the outer layer of the planet cooled, resulting in the solid crust. Outgassing and volcanic activity produced the primordial atmosphere; condensing water vapor, augmented by ice delivered by comets, produced the oceans. Scientists think that early living organisms may have existed more than 3.5 billion years ago. Later, as photosynthetic organisms developed, they could harvest the Sun's energy directly. As a result, oxygen accumulated in the atmosphere and gave rise to the ozone layer. With the ozone layer absorbing harmful ultraviolet radiation, life forms were able to colonize the Earth's surface. Since the 1960s, it has been hypothesized that severe glacial action during the Neoproterozoic, between 750 and 580 m.y.a., covered much of the planet in a sheet of ice. This hypothesis, termed "Snowball Earth," is of particular interest as it precedes the Cambrian explosion when multicellular life forms began to proliferate. It appears that from the time of the Cambrian explosion, about 535 million years ago, there were five distinct mass extinctions. The last one occurred 65 million years ago, when a meteorite collision is thought to have triggered the extinction of the (non-avian) dinosaurs and other large reptiles, but spared small animals such as mammals, which seem to have resembled shrews. Over the last 65 million years, mammalian life diversified. Once humans appeared, they transformed the Earth in a short time span like no other life form had before. Humans have influenced both the nature and quantity of other life forms, as well as global climate. A map pointing out the Earth's major plates. Plate tectonics (from the Greek word τεκτων, tektoon, meaning "one who constructs and destroys") is a theory that arose out of two separate geological observations: continental drift, noticed in the early twentieth century, and seafloor spreading, noticed in the 1960s. The theory was developed during the late 1960s and has since been accepted by virtually all scientists working in the field. According to this theory, the lithosphere is broken up into what are called tectonic plates, which essentially "float" on the asthenosphere. These plates move in relation to one another. Earthquakes, volcanic activity, mountain-building, and oceanic trench formation occur along plate boundaries. This theory has revolutionized earth science (geology) and is valued for its unifying and explanatory power for diverse geological phenomena. An image showing the rotation of the Earth. It takes the Earth, on average, 23 hours, 56 minutes, and 4.091 seconds (one sidereal day) to rotate around the axis connecting the North and South Poles. From Earth, the main apparent motion of celestial bodies in the sky (except meteors, which are within the atmosphere, and low-orbiting satellites) is the movement to the west at a rate of 15 °/h (= 15'/min), that is, a sun or moon diameter every two minutes. Earth orbits the sun every 365.2564 mean solar days (one sidereal year). From Earth, this gives an apparent movement of the sun with respect to the stars at a rate of about one degree per day, that is, a sun or moon diameter every 12 hours, eastward. The Earth's orbital speed averages about 30 km/s (108,000 km/h), which is enough to cover one Earth diameter (~12,600 km) in seven minutes, and one distance to the moon (384,000 km) in four hours. Earth has one natural satellite, the moon. The diameter of the sun is about 400 times that of the moon, but the moon is 400 times closer to the Earth than the sun. Consequently, the sun and moon appear roughly equal in size when viewed from the Earth. Moreover, this apparent equality of size allows us to observe a total solar eclipse, when the moon completely covers the sun, and an annular eclipse, when the sun appears slightly larger than the moon and produces a bright ring (annulus) around the moon. Viewed from Earth's north pole, the motion of Earth, its moon, and their axial rotations are all counterclockwise. The orbital and axial planes are not precisely aligned: Earth's axis is tilted some 23.5 degrees against the Earth-Sun plane. This tilt has significant effects, including the variations of seasons. Also, the Earth-moon plane is tilted about 5 degrees against the Earth-Sun plane—otherwise, there would be an eclipse every month. In modern times, the Earth reaches its perihelion (when the planet is nearest to the Sun) about January 3, and its aphelion (when it is farthest from the Sun) about July 4. (These dates are near the solstices, which occur around December 21 and June 21). The moon, sometimes called "Luna," is a relatively large satellite that structurally resembles a terrestrial planet. The moon's diameter is about one-quarter that of the Earth. The natural satellites orbiting other planets are also called moons, after the Earth's moon. With the exception of Pluto's Charon, it is the largest moon in the solar system relative to the size of its planet. The most widely accepted theory of the moon's origin, the "giant impact hypothesis," states that it was formed from the collision of a Mars-size protoplanet with the early Earth. This hypothesis explains (among other things) the moon's relative lack of iron and volatile elements, and the fact that its composition is nearly identical to that of the Earth's crust. 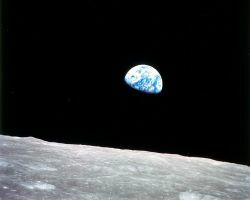 Earthrise as seen from lunar orbit on Apollo 8, December 24, 1968. The moon always presents the same face to the Earth. Consequently, our planet, when viewed from the moon, does not rise or set, but is always located in the same position in the sky. The gravitational attraction between the Earth and moon causes the tides on Earth. The same attraction has led to a phenomenon known as tidal locking: The moon's rotation about its own axis takes the same time as its orbit around the Earth. As a result, the moon always presents the same face to our planet. As the moon orbits Earth, different parts of its face are illuminated by the Sun, leading to the lunar phases. The dark part of the face is separated from the light part by what is called the solar terminator. Based on a phenomenon called tidal acceleration, the moon recedes from Earth at a rate of approximately 38 millimeters (mm) per year. The Earth's day also lengthens by about 17 microseconds (µs) every year. Over millions of years, these tiny modifications can add up to significant changes. During the Devonian period, for example, there were 400 days in a year, with each day lasting 21.8 hours. The moon may dramatically affect the development of life by taming the weather. Paleontological evidence and computer simulations show that Earth's axial tilt is stabilized by tidal interactions with the moon. Some theorists believe that without this stabilization against the torques applied by the Sun and planets to the Earth's equatorial bulge, the rotational axis might be chaotically unstable, as it appears to be for Mars. If Earth's axis of rotation were to approach the plane of the ecliptic (the apparent path of the Sun as viewed from the Earth), seasonal differences could become extreme, resulting in severe weather conditions. One pole would be pointed directly toward the Sun during summer and directly away during winter. Planetary scientists who have studied the effect claim that this might kill all large animal and higher plant life. This remains a controversial subject, however, and further studies of Mars—which shares Earth's rotation period and axial tilt, but not its large moon or liquid core—may provide added insights. The relative sizes of and distance between Earth and moon, to scale. The Earth does not have a natural orbiting body other than the moon, although the asteroid Cruithne has been erroneously described as such. Cruithne was discovered in 1986 and follows an elliptical orbit around the Sun at about the same average orbital radius as the Earth. However, from the point of view of the moving Earth, Cruithne follows a horseshoe orbit around the Sun that avoids close proximity with the Earth. 1.4 × 109 km3, of which 2.5% is freshwater. Earth is the only place in the universe where life is absolutely known to exist. The various life forms on Earth are sometimes said to form a biosphere. The biosphere is divided into a number of biomes, inhabited by broadly similar flora and fauna. On land, biomes are separated primarily by latitude. Terrestrial biomes lying within the Arctic and Antarctic Circles are relatively barren of plant and animal life, while most of the more populous biomes lie near the equator. The most prominent features of the Earth's climate are its two large polar regions, two narrow temperate zones, and a wide, equatorial, tropical to subtropical region. Precipitation patterns vary widely, ranging from several meters of water per year to less than a millimeter per year. Ocean currents are important factors in determining climate, particularly the spectacular "thermohaline circulation" (the density-driven circulation of the oceans), which distributes heat energy from the equatorial oceans to the polar regions. The Earth's terrain can vary greatly from place to place. Only about 30 percent of the Earth's surface consists of dry land, while the remainder is covered with water. The exposed land has mountains, deserts, plains, plateaus, and so forth. Currently, the total arable land is 13.31 percent of the land surface, with only 4.71 percent supporting permanent crops. Close to 40 percent of the Earth's land surface is presently used for cropland and pasture, or an estimated 3.3 × 109 acres of cropland and 8.4 × 109 acres of pastureland. The Earth's crust contains large deposits of fossil fuels, including coal, petroleum, natural gas, and methane clathrate. We tap these deposits for energy production and as feedstock for chemical production. Mineral ore bodies have been formed in the Earth's crust by the action of erosion and plate tectonics. These bodies form concentrated sources for many metals and other useful elements. Earth's biosphere produces many useful biological products, including (but not limited to) food, wood, pharmaceuticals, oxygen, and recycled organic wastes. The land-based ecosystem depends upon topsoil and fresh water, and the oceanic ecosystem depends upon dissolved nutrients washed down from the land. Some of these resources, such as mineral fuels, are difficult to replenish over a short time scale. They are therefore called non-renewable resources. The exploitation of non-renewable resources by humans has become a subject of significant controversy. Many places experience natural hazards such as hurricanes, earthquakes, landslides, tsunamis, volcanic eruptions, tornadoes, sinkholes, blizzards, floods, droughts, and other calamities. In addition, large areas are subject to human-made pollution of the air and water, loss of vegetation (as a result of overgrazing, deforestation, and desertification), loss of wildlife, species extinction, soil degradation, soil depletion, erosion, and the introduction of invasive species. There is also concern about global warming, based on a "greenhouse effect" caused by increasing emissions of carbon dioxide and particulate matter, and this subject is the focus of intense study and debate. 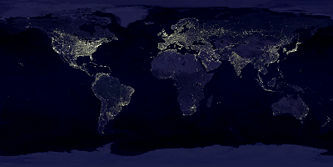 Earth at night, composite of pictures taken between October 1994 and March 1995. 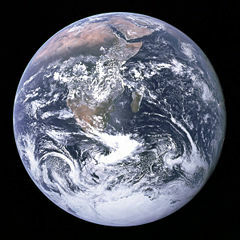 The Earth has over 7 billion human inhabitants. Human population density varies widely around the world. It is estimated that only one-eighth of the Earth's surface is suitable for humans to dwell on. About 30 percent of the surface is exposed land (above the oceans), and about half of that is desert, high mountains, or other unsuitable terrain. The northernmost settlement in the world is Alert, Nunavut, on Ellesmere Island in Canada. The southernmost is the Amundsen-Scott South Pole Station in Antarctica, almost exactly at the South Pole. There are 267 administrative divisions, including nations, dependent areas, and other miscellaneous territories. Earth does not have a sovereign government with planet-wide authority. Independent sovereign nations claim all the land surface except for some segments of Antarctica. The United Nations is a general international organization, but it is primarily a discussion forum with only limited ability to pass and enforce international laws. Comparison between the red giant Antares and the Sun. The black circle is the size of the orbit of Mars. According to current models, the Earth's destruction will take place in about 5 billion years (Gigayears, Gyr), when the Sun (as part of its solar lifespan) expands to a form called a Red Giant. It is thought that the Sun will expand out to about 99 percent of the distance to the Earth's present orbit (1 Astronomical Unit, or AU). 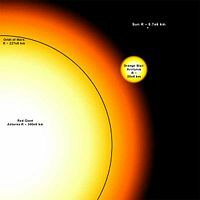 By that time, however, the Earth's orbit will expand to about 1.7 AU, due to mass loss by the Sun, and so the planet will escape envelopment..
Before reaching the Red Giant stage, however, the Sun's luminosity is predicted to increase steadily—by 10 percent in 1.1 Gyr and up to 40 percent in 3.5 Gyr. Climate models show that a steady increase in radiation reaching the Earth is likely to have dire consequences, including possible loss of the oceans. ↑ G.B. Dalrymple, The Age of the Earth (Stanford, CA: Stanford University Press, 1991, ISBN 0804715696). ↑ Forrest J. Ackerman, Forrest J Ackerman's World of Science Fiction (Los Angeles, CA: RR Donnelley & Sons Company, 1997, ISBN 1575440695), 116-117. ↑ Pale Blue Dot SETI@home. Retrieved October 26, 2018. ↑ "Geodetic Reference System 1980 (GRS80)," XVII General Assembly, International Association of Geodesy. ↑ T. H. Jordan, "Structural Geology of the Earth's Interior," Procedings National Academy of Science, 1979, Sept., 76(9): 4192–4200. Retrieved October 26, 2018. ↑ A. Morbidelli et al, "Source Regions and Time Scales for the Delivery of Water to Earth," Meteoritics & Planetary Science, 35(6) (2000): 1309-1320. Retrieved October 26, 2018. ↑ W. Ford Doolittle, "Uprooting the Tree of Life," Scientific American, Feb. 2000. ↑ L. V. Berkner, L. C. Marshall, "On the Origin and Rise of Oxygen Concentration in the Earth's Atmosphere," Journal of the Atmospheric Sciences, 22(3) (1965): 225–261. ↑ J.B. Murphy and R.D. Nance, "How do supercontinents assemble? ", American Scientist, 92(4) (2004): 324-333. ↑ J.L. Kirschvink, "Late Proterozoic Low-Latitude Global Glaciation: The Snowball Earth," The Proterozoic Biosphere, 1992, 51-52. ↑ D. Raup & J. Sepkoski, "Mass extinctions in the marine fossil record," Science, 215 (1982): 1501–1503. ↑ Laskar, J., Robutel, P., Joutel, F., Gastineau, M., Correia, A.C.M., Levrard, B., "A long term numerical solution for the insolation quantities of the Earth," Astronomy and Astrophysics, 428 (2004): 261-285. Retrieved October 26, 2018. ↑ D.M. Williams, J.F. Kasting, "Habitable planets with high obliquities," Icarus 129 (1997): 254-268. ↑ 14.0 14.1 14.2 14.3 14.4 14.5 CIA, "World" The World Factbook. Retrieved October 26, 2018. ↑ Igor A. Shiklomanov, "World fresh water resources," In Water in crisis: A guide to the world's fresh water resources, ed. Peter H. Gleick (New York: Oxford University Press, 1993, ISBN 0195076273), 13–24. ↑ FAO, "United Nations Food and Agricultural Organization Production Yearbook," 1995, 49. ↑ 17.0 17.1 I.J. Sackmann, A.I. Boothroyd, K.E. Kraemer, "Our Sun. III. Present and Future.," Astrophysical Journal, 418 (1993): 457. Retrieved October 26, 2018. ↑ J.F. Kasting, "Runaway and Moist Greenhouse Atmospheres and the Evolution of Earth and Venus," Icarus, 74 (1988): 472-494. Retrieved October 26, 2018. Ackerman, Forrest J. Forrest J Ackerman's World of Science Fiction. Los Angeles, CA: RR Donnelley & Sons Company, 1997. ISBN 1575440695. Comins, Neil F. Discovering the Essential Universe. 2nd ed. New York: W.H. Freeman, 2001. ISBN 978-0716744382. Dalrymple, G.B. The Age of the Earth. Stanford, CA: Stanford University Press, 1991. ISBN 0804715696. Gleick, Peter H. (ed.). Water in crisis: A guide to the world's fresh water resources. New York: Oxford University Press, 1993. ISBN 0195076273. Gonzalez, Guillermo, and Jay Wesley Richards. The Privileged Planet: How Our Place in the Cosmos Is Designed for Discovery. Washington, DC: Regnery Pub, 2004. ISBN 978-0895260659. Greene, Nick. Explore Earth - Our Home Planet ThoughtCo, March 2, 2017. Retrieved July 29, 2017. Ward, Peter Douglas, and Donald Brownlee. Rare Earth: Why Complex Life Is Uncommon in the Universe. New York: Copernicus, 2003. ISBN 978-0387952895. NASA's Earth fact sheet Retrieved July 29, 2017. All links retrieved October 22, 2018. This page was last modified on 26 October 2018, at 16:39.